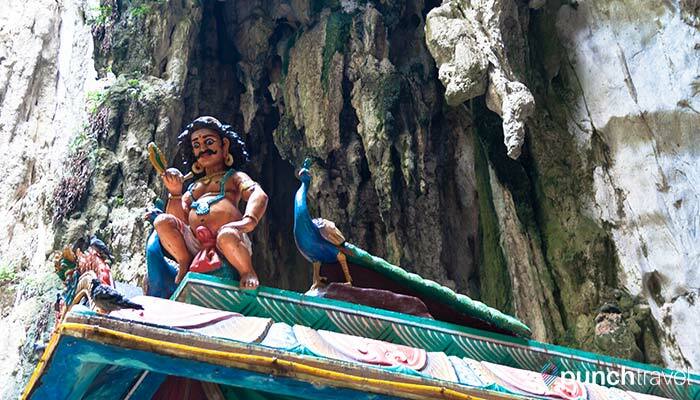 Only about 20 minutes north of Kuala Lumpur, Batu Caves is a limestone hill composed of caves and temples. 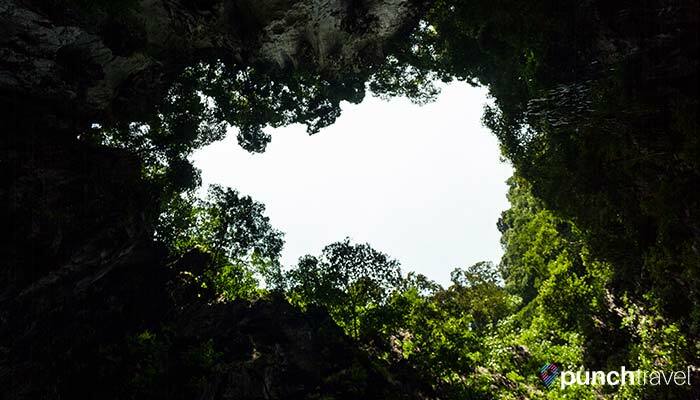 The two most well known features are Temple Cave, a Hindu religious site, and the wildlife in Dark Cave. 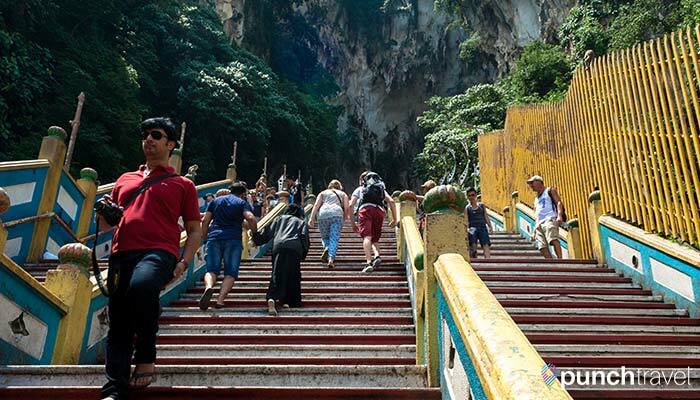 Batu Caves’ proximity to Kuala Lumpur makes it a popular tourist destination but it is visited by even more Hindu devotees. The temple plays an important role in the Thaipusam festival held in January/February. Devotees walk the 12km from Sri Maha Mariamman Temple in Kuala Lumpur to Batu Caves carrying offerings of milk to Lord Murugan, the Hindu god of war. 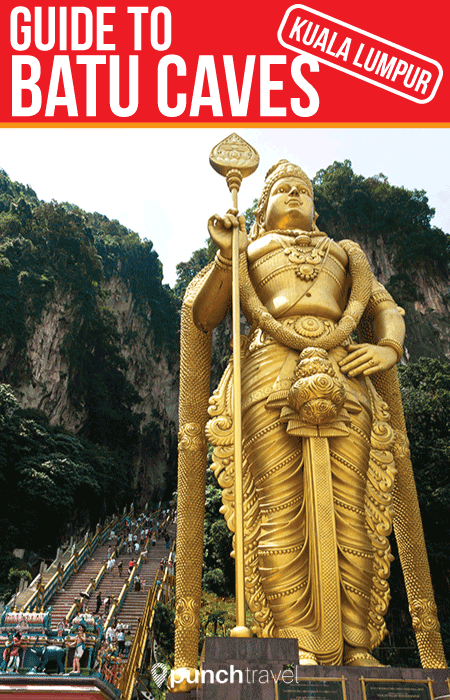 You can’t miss the giant golden statue of Lord Murugan at the base of the cave. 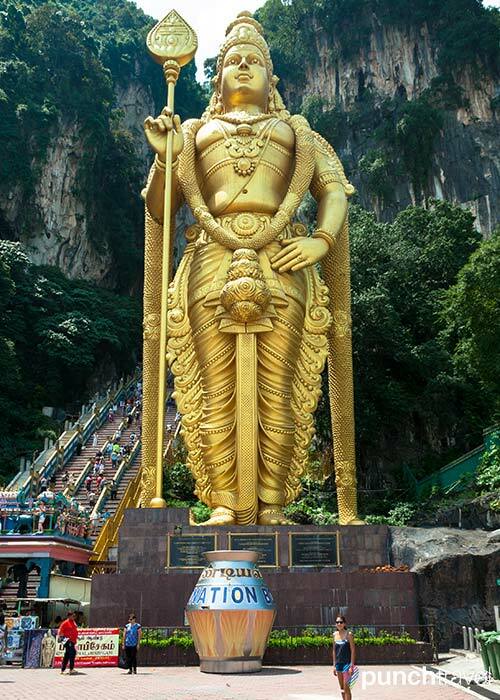 The 42.7 meter tall statue is the largest statue of Murugan in the world. Even though it’s not in Kuala Lumpur, it is an easy, direct ride on the KL Komuter line. The train runs every 45 minutes during off-peak hours, and every 15 minutes during on-peak times (between 4pm-8pm on weekdays). We went in the afternoon and only waited about 10 minutes for the train to Batu Caves. The ride cost 2.30 RM from Putra station. Batu Caves is the last station on the line. 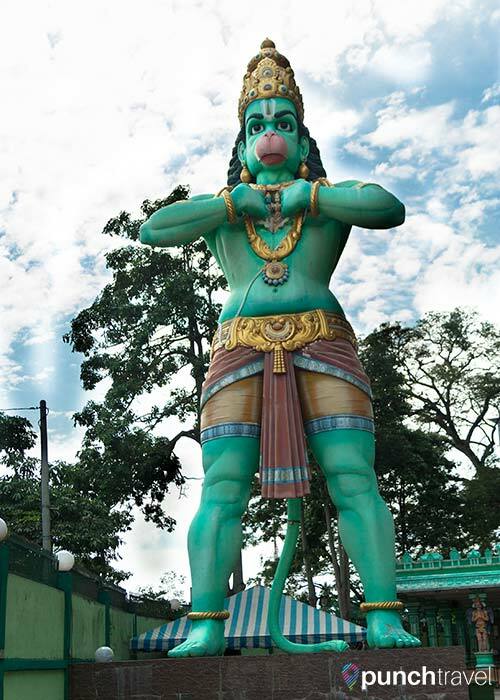 Just outside the train station is a large green monkey deity statue marking the entrance to Batu Caves with a small temple next to it. As we walked towards the entrance of the cave, booths with crackers, rice and cartons of milk piled high were for sale. But these are not snacks, they are intended to be religious offerings. 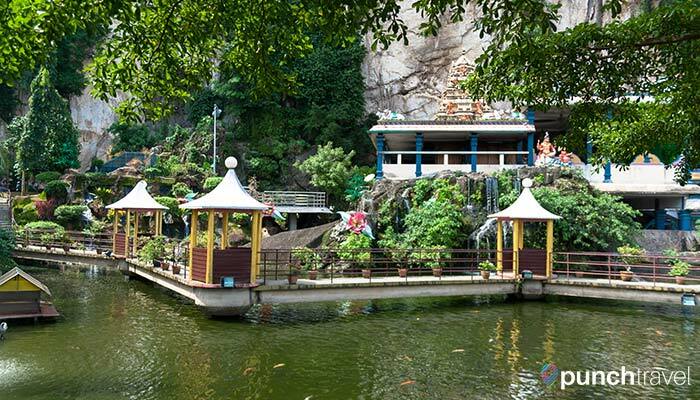 At the foot of the cave is Cave Villa, an art gallery with Hindu statues and paintings. Outside is a small pond and fountains with hundreds of koi fish and tortoises. It didn’t appear to be that popular among visitors so we decided to skip it. Batu Caves is first and foremost a Hindu religious site and entrance to the Temple Cave at Batu Caves is free. However, appropriate clothing is required. Shorts or skirts must be at least knee-length. I didn’t realize this before visiting, so had to pay 3 RM to rent a sarong. 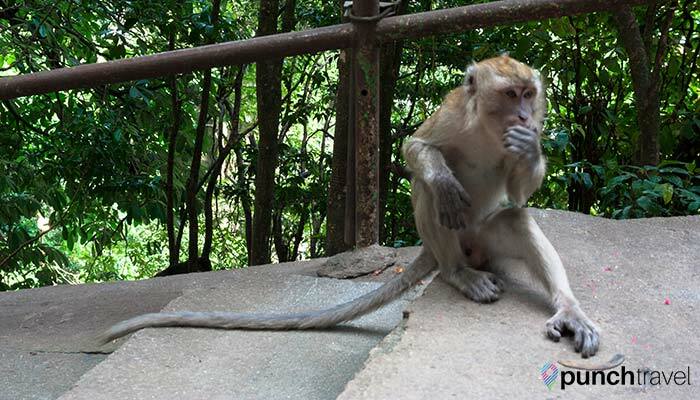 After our run-in with an aggressive monkey in Redang, I was a little wary of the macaques, but these monkeys were clearly used to interacting with humans. The monkeys were snatching bags of chips out people’s hands and drinking bottles of Coca-Cola. So, as long as you don’t carry food, you won’t be bothered by the monkeys. 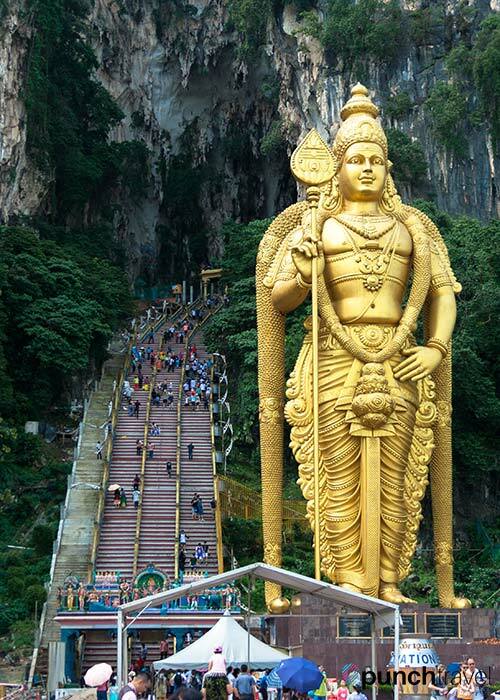 A 272-step staircase stands between the Lord Murugan statue and the interior of the cave. I’ve read a lot of other accounts about the stairs at Batu Caves, but after climbing them I can report that they weren’t bad at all. 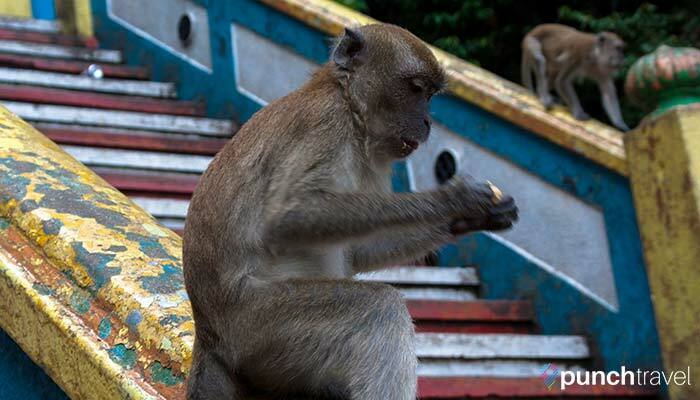 You can hold on to the handrails, but remember, monkey butts have been on these railings! At the top of the staircase is a gate marking the entrance to the Hindu temple. If you didn’t purchase your religious offerings or souvenirs, you have another chance to buy them here. Entering the cave, the depth and magnitude of the cavern is impressive. It is dark, wet and stalactite covered in moss surround the walls. In little nooks and crannies are small shrines dedicated to different gods. Inside the cave are another set of stairs that took us deeper into the cave to another small temple. From where we stood, we could look up and see patches of sky peeking through the caves. 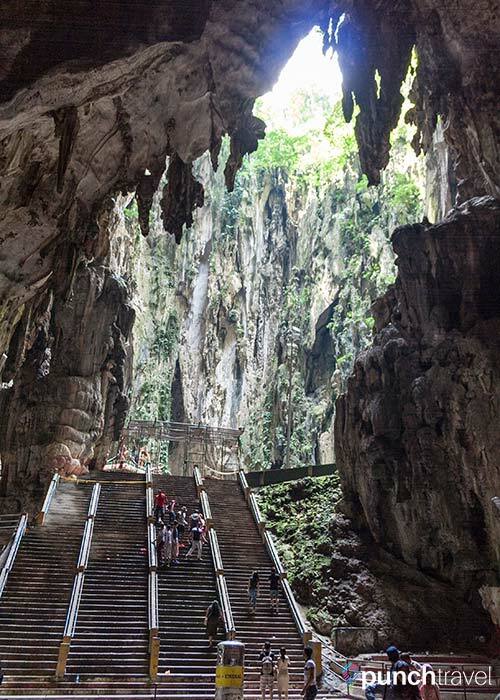 Halfway up the main staircase, is an adjacent cave site, Dark Cave, where you can explore 2 kilometers of cave formations. 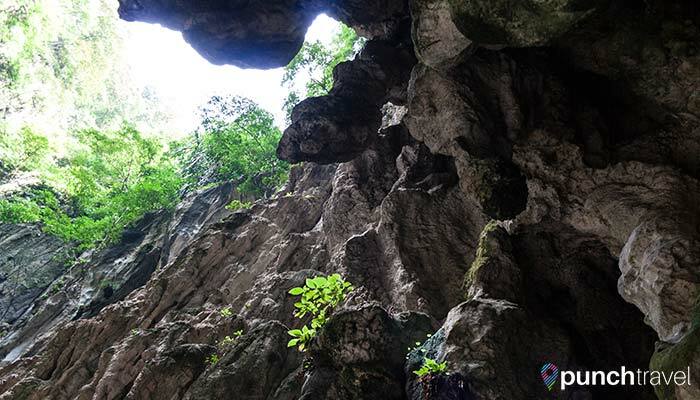 Dark Cave is home to a diverse wildlife community dating back to 100 million years old, with many species being endemic to the cave, like the trapdoor spider. The most important creature in the Dark Cave are bats, and it is estimated that over 200,000 bats reside within the cave. If you don’t mind getting up and close with cockroaches, millipedes, and other creepy-crawlies, two tours are available: a 45 minute guided tour, and a 4 hour adventure tour that involves climbing, sliding and crawling through the caves. Several restaurants at the base of the cave serve Indian and Malaysian food. You can also purchase refreshments or fresh coconuts from the many vendor carts. Appropriate clothing is required when visiting Batu Caves. Sarongs are available to rent at the base of the stairs. The inside of the cave is wet and not well lit so you may want to wear proper footwear. 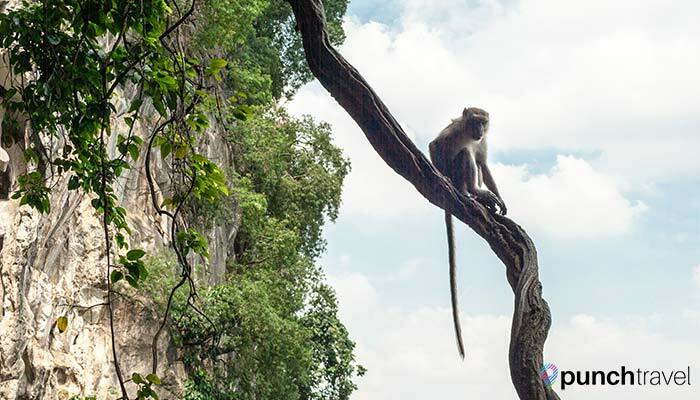 There are a lot of half-day tours to Batu Caves from Kuala Lumpur, but there is no need to do a group tour. Getting to Batu Caves on your own with public transportation is very easy. Plus you’ll have all the time you need to explore the caves. We spent about three hours at Batu Caves, without touring Dark Cave or Cave Villa.